WOMEN AT LIBERTY, a program in association with FOR THIS CAUSE, Inc. and Liberty Ink Productions, is produced for women by women. 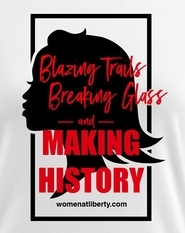 Pre-Order the NEW "Women Making History" T-Shirts! Only $24!